KOSO mini temp gauge from 0 to 250 degrees C. 1/8th thread for Minarelli and Morini engines and connector cable 1.4m in length. Same design as the Stage6 temperature gauge. 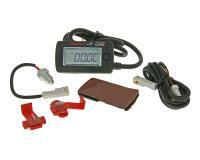 Sensors can be found for AC engines and LC engines from Piaggio and Peugeot. All LC engines, can use the practical water hose adapter. includes sensor with extension cable, PT 1/8 water sensor, 2 cable clips, and self -closing Velcro fastener. CR2032 battery required. Dimensions: 33.7x61.7x15.6mm.